Always staying updated with the latest in your project is now as easy as browsing your favorite social network. You can add a task, upload an image, file an issue or just post a status message directly into the feed. Discuss and decide quickly by adding comments right here! Have a question or idea which you want the whole team to consider? Calling a meeting could be costly and take time. Just post it to the project feed and get the discussion going through comments. This lets everyone give their inputs at their convenience and helps you arrive at decisions sooner. Miss an important update, Never! This is one place where you can get a quick update on everything important. A critical task has been completed, a new person has joined, an announcement has been made, a new idea has been proposed, a page has been updated - get a consolidated view of everything. 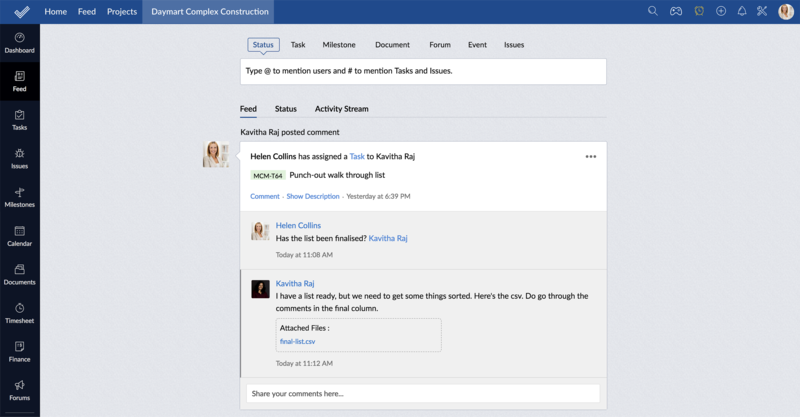 The activity stream of your project gives you a timeline view of what your team members have been up to. It is arranged chronologically so that the most recent updates are on top. The saying a picture is worth a thousand words is all the more true when it comes to sharing ideas. Simply drag images from your desktop into the status bar and post, and you are now set to receive feedback from your team.